Mario Batali, The Lunchbox Fund team up for an app that turns pics into lunches. camera (The Lunchbox Fund) Feedie, and app created by The Lunchbox Fund and Mario Batali, provides users with a way to give back when they post photos of their meals out. What does this app do? : Snapping photos of food with a smartphone and posting them to social media sites is as ubiquitous as the online presence many aim to cultivate. Food provides a platform to express oneself; my own photo of a recent lobster dinner pops with bright red, I like to think, and screams "Look! I'm almost an artist!" Or, a shot of a group of your friends at a trendy new cafe carries with it implicit bragging rights-- "Hey, me and my clique know where to go." But what if the act of taking photos of the food you eat when dining and posting them social media meant you were also doing something charitable, too? That's what Topaz Page-Green, founder of The Lunchbox Fund, a non-profit organization that provides at-risk school children in South Africa with healthy lunches, decided to do. Page-Green teamed with world renowned chef Mario Batali, to create Feedie, an app that allows users to turn the photos of the meals they eat when they eat out into real, tangible lunches for children in need. Recognizing the potentially charitable impact sites like Facebook and Twitter hold, Page-Green says she saw a natural connection between social media and her work. "Feedie creates a wonderful symmetry between tech and philanthropy," said Page-Green. "It also nourishes the users of the app by giving them the opportunity do something incredibly positive." Once you open the Feedie, select a participating restaurant, --The Spotted Pi or La Esquina, for example,--and then check in. From there, take a photo of your meal, share it to Facebook or Twitter, and the restaurant will make a donation to The Lunchbox Fund. For now, the app includes approximately 100 restaurants and most are in New York City, but Page-Green intends to bring on more. "What is so wonderful about Feedie is that its not limited by any geographical boundaries," she said. Page-Green also said she hopes to add a "Love Counter" and support for Android soon. Is it easy to install? 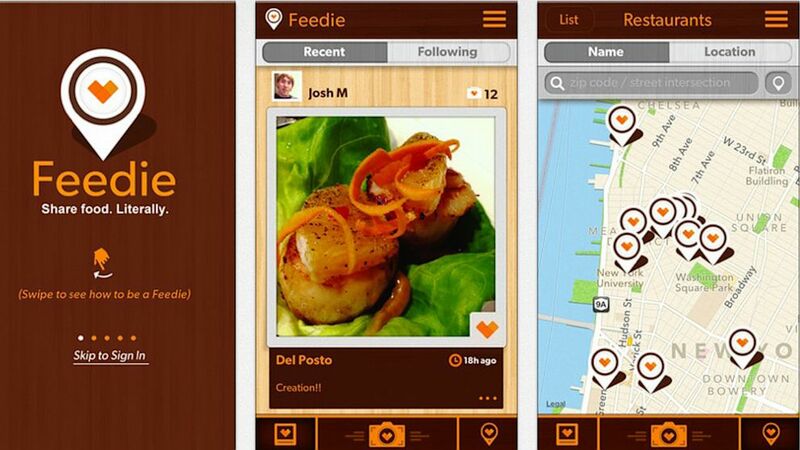 : Getting started with Feedie requires two simple steps: download the app from the iTunes store, and then sign in using Facebook or Twitter, two likely places you might post a picture of your meal. Should I try it? : Feedie taps into the prevalent compulsion many would-be food photographers possess to snap and share photos of their meals out, and channels that urge into a constructive way a to give back. Often a photo of a meal can conjure the taste, the smell , and the ambience of the experience, but now it can also produce a meal for someone else who truly needs one. "We are feeding children. It's that simple. You take a photo, you feed a child," said Page-Green.